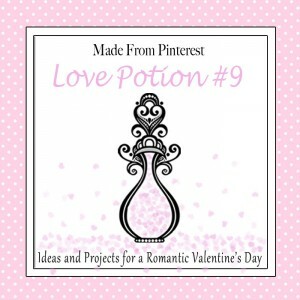 Welcome to our Love Potion #9 series! 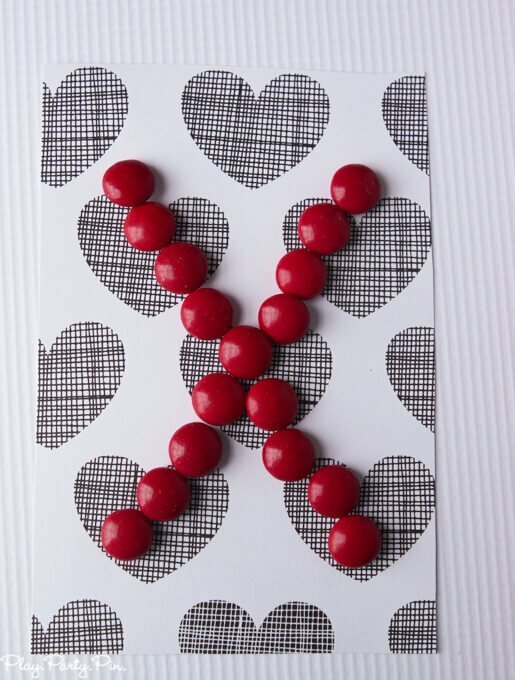 We have 15 amazing, talented bloggers who will be sharing some of the best Valentine’s Day ideas and projects from all across Pinterest. 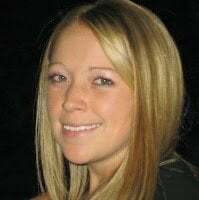 We are thrilled to have Britni from Play. Party. Pin. here to get the party started! Hi Made from Pinterest readers, my name is Britni and I blog over at Play. Party. Pin. 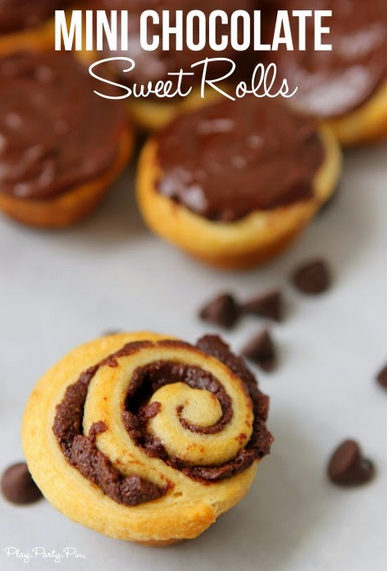 I love all things having to do with parties – games, food, crafts, and fun – and Pinterest! 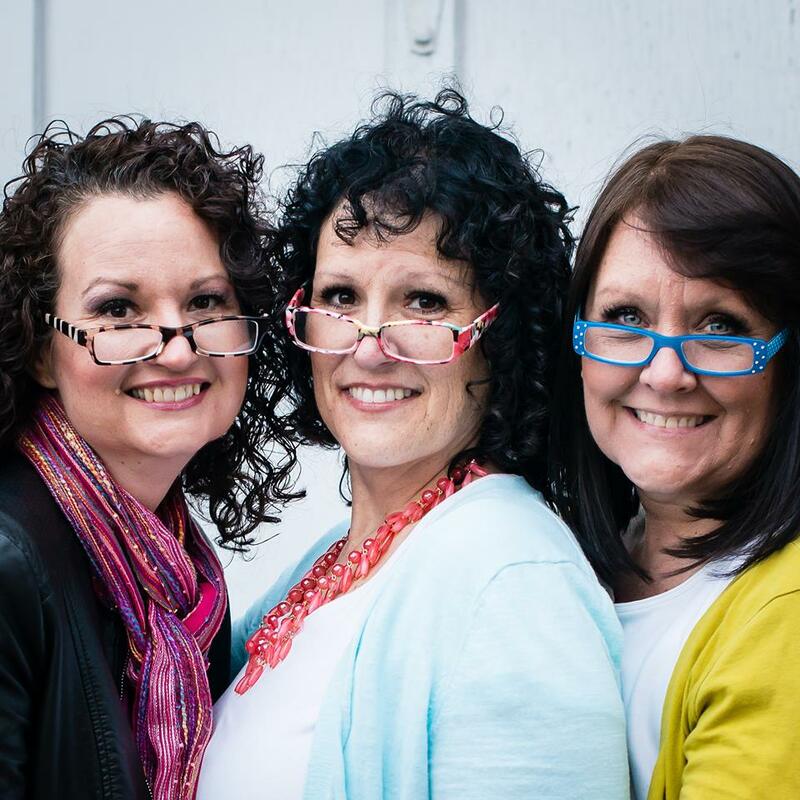 I actually had the chance to meet the Made from Pinterest ladies at SNAP Conference last year and absolutely love the sweet trio. 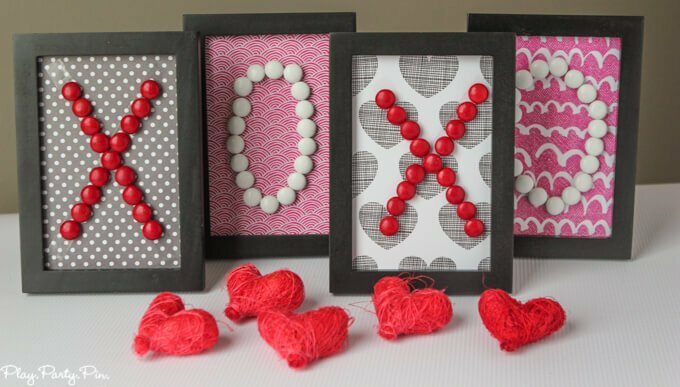 I am so excited to be here sharing this fun Valentine’s day craft with you and hope you’ll come by and say hi to me sometime on my blog. The ladies asked me to search for a Valentine’s day pin that I wanted to try. I’m one of those people who pins millions of things and then tries about 10 of them, so it was really fun to go look through all of the awesome ideas I’ve pinned over the years. 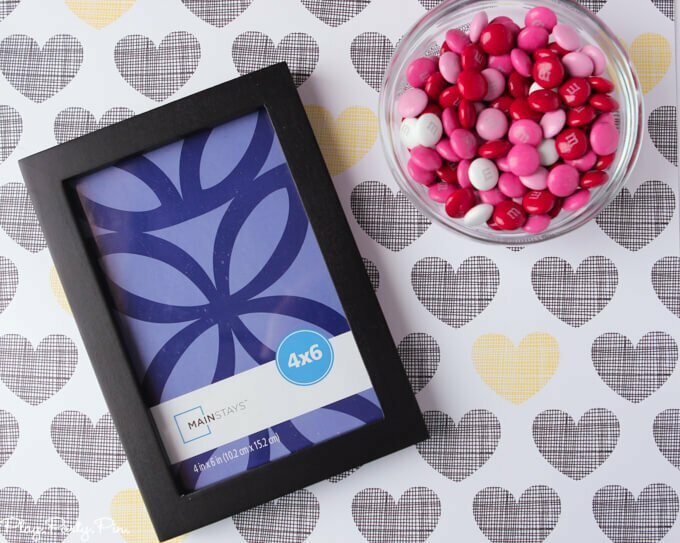 I needed some Valentine’s day decorations for my mantle and this simple xoxo Valentine project from Tatertots and Jello seemed like the perfect fit. 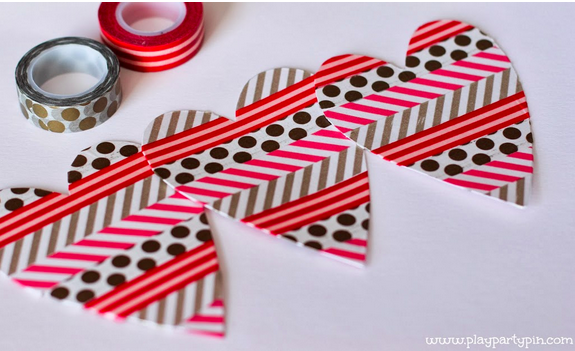 The beauty of this project is that it really is one that you can do in just a few minutes, but it’s still super cute. In fact, I did it while my toddler was watching his one episode of cartoons one afternoon. With him getting up every few minutes to ask for more M&Ms, it still only took me about 20 minutes total and that included photographing everything. Step 1 – Take the glass and placeholder paper out of the picture frame. 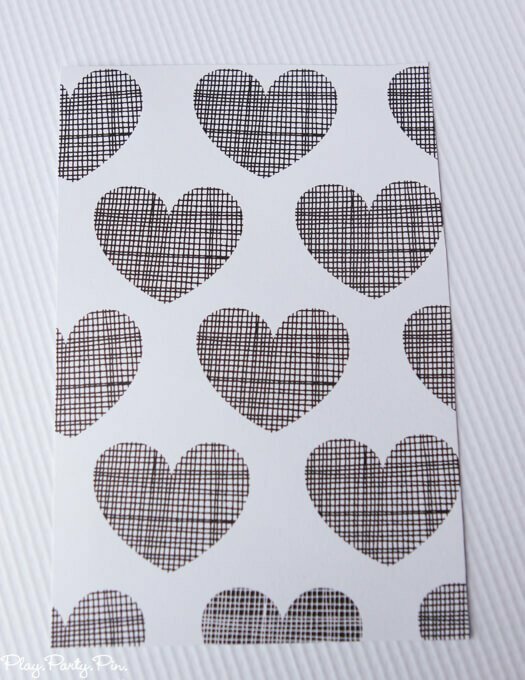 Using a piece of double-sided tape, tape the paper to the back of one of your pieces of scrapbook paper. 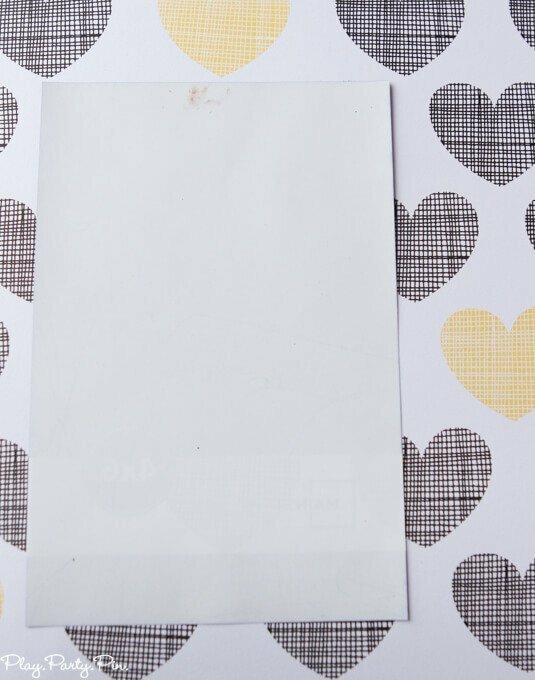 Cut around the placeholder paper to get a piece of scrapbook paper that is a perfect fit for your frame. Repeat for all four pieces of scrapbook paper. Step 2 – Using your measuring tape or ruler, find the middle of the card and hot glue one M&M directly in the middle. Hot glue the other M&Ms in an X shape on two of the cards. 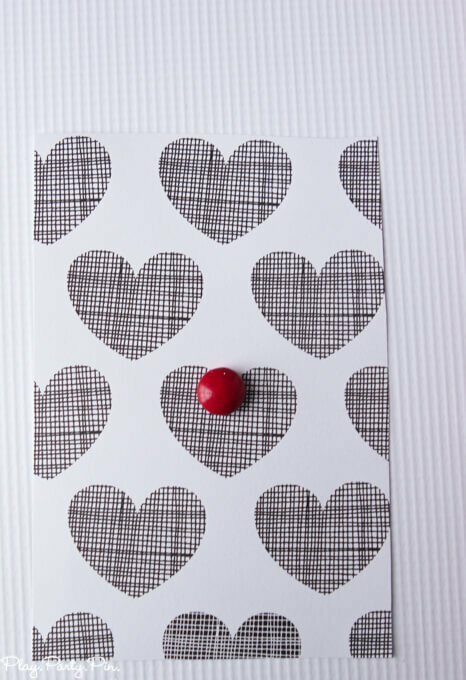 I chose to put red M&Ms on two black scrapbook paper pieces, but you can do whatever works best with your decorations. 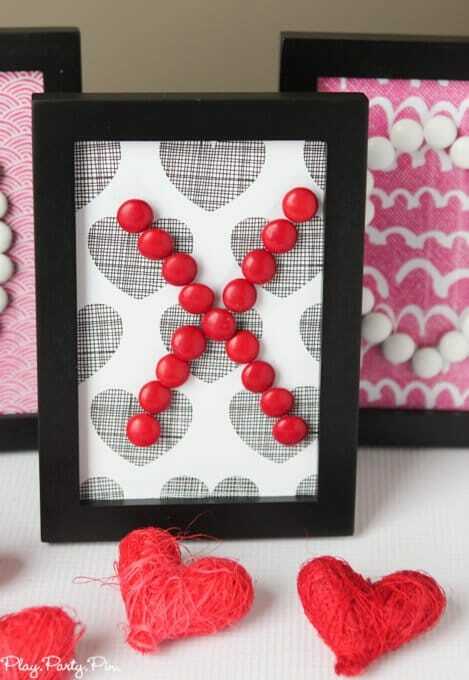 Step 3 – On your other two pieces of scrapbook paper, hot glue M&Ms in an O shape. Then put all four of the pages back into the frames (take the glass out first! ), putting the glass behind the scrapbook paper to both give the page more support and so you can use the frame with glass later. I’m already thinking about what versions of this craft I could make for all of the other holidays! I could see the word lucky being cute or maybe Ho Ho for Christmas. The possibilities are pretty endless! 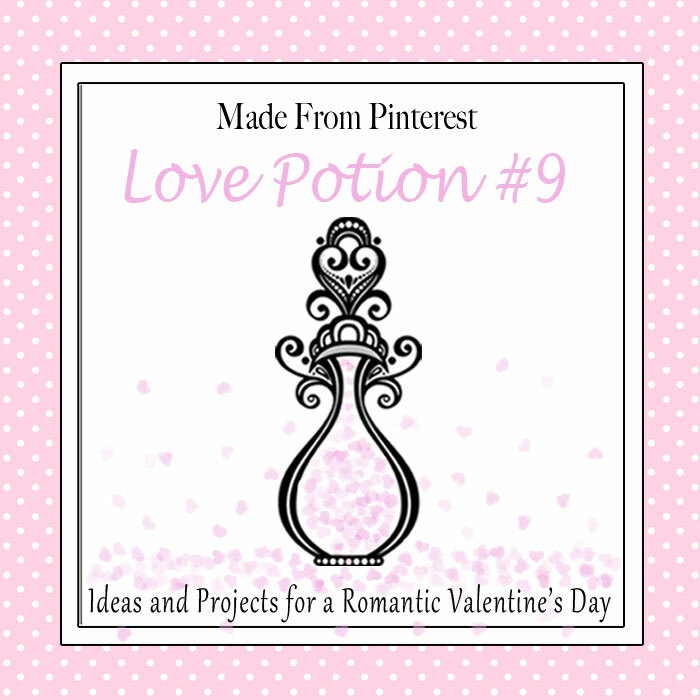 Thanks again to you all as well as the Made from Pinterest team for letting me participate in this Love Potion #9 series! I I’d love it you follow me along on Facebook and Instagram to see what new ideas I’m sharing this year! Stop by Play. Party. Pin. 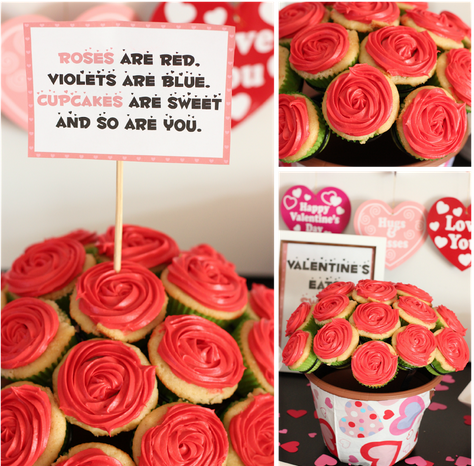 for all your Valentine’s Day Party needs!